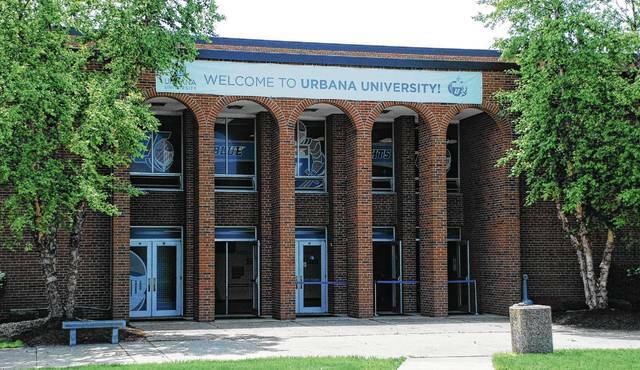 Can Urbana become college town? Located on the south end of campus, the Warren G. Grimes Center is arguably Urbana University’s most well-known building. Whether it’s the city of Oxford (Miami University) or the city of Athens (Ohio University), the state of Ohio is home to its fair share of municipalities where the city and university embrace one another to create their own unique college town atmosphere. While the city of Urbana has never been labeled a true “college town” despite being home to Urbana University since 1850, two men – UU Executive Vice President and Provost Christopher L. Washington, Ph.D., and Urbana Mayor Bill Bean – are confident now is the time to forge a lasting bond between the university and community. Since stepping foot on the UU campus in late April after being named the university’s new leader, Washington said, he has received a “warm reception from members of this community,” many of whom appear eager to build a stronger bond with the university. Washington said his plans to unite the university and city starts with leaning on Bean for guidance considering his strong ties to both entities. A 1971 graduate of UU, Bean has been a university trustee and past president of the alumni association. The second-term mayor currently serves on the Urbana Planning Commission and was a past member of City Council. Bean said when Franklin University acquired UU in 2014, he viewed it as a “godsend” not only for his alma mater, but also from the standpoint of bringing the university and community together as one. The biggest key toward unity, he added, involved getting the right leadership on board, which Bean believes Franklin University President David R. Decker, Ph.D. has done by giving Washington the reins to UU. “Dr. Washington has been around, and he understands what it takes to bring the community and university together,” Bean said. “I’ve always wanted to see it done, and he has a partner in me. “I really think he talks the talk, and I think he’ll walk the walk. I’m looking forward to really working with him and being part of the Urbana University community, which in turn will be part of the city of Urbana community,” he added. Bean said he realizes creating more of a college town atmosphere in Urbana won’t happen overnight and that it will take more than just he and Washington working toward this goal. “All in all, getting the university working with not only the city, but also the school system, manufacturers and CEP, I think, is what is really going to turn things around,” he said. As for city residents, many of whom enjoy cheering on their favorite sports teams, one challenge going forward, Bean added, involves getting them to adopt some level of allegiance for Blue Knight athletics. “There are a lot of people who bleed maroon and white (Urbana High School colors), but they don’t bleed blue and white (UU colors),” he said. Since UU is in the business of higher education, hosting events that steer youngsters and their families to the 128-acre campus is on the top of Washington’s list when it comes to developing a bond between the community and university. Washington said that until he gets more accustomed to the ins and outs of campus and the local community, he’s been learning all he can from those familiar with UU and the city of Urbana. “The staff here has really charged me up about the potential for community engagement and what we can do more of to embrace the community,” he said.